• Plug-and-play with included TRAKTOR SCRATCH PRO software DJ Shiftee, two turntables, and the power of TRAKTOR KONTROL S8 Introducing TRAKTOR KONTROL S8: The flagship all-in-one DJ controller THE FUTURE OF DJING Experience a new way to mix and perform with TRAKTOR KONTROL S8 - a 4-channel stand-alone mixer, professional audio interface, and enhanced Stems*-ready decks for ultimate control over the included TRAKTOR SCRATCH PRO software. Touch-sensitive controls and high-res displays deliver DJ workflow that is truly cutting-edge. Create mixes that truly stand out - the S8 is Stems-ready. Advanced controls, decks, and stand-alone mixer deliver everything you need to DJ. Connect turntables or CDJs for control with included TRAKTOR SCRATCH PRO software. High-res displays react to touch-sensitive controls so your focus is always on the music. Remix Deck channel faders and pads to get creative and build your signature sound. The pro 4-channel mixer features an integrated audio interface and standalone functionality. Built-in, club-ready audio with pristine 24-bit/48kHz clarity. STEMS-READY TRAKTOR KONTROL S8 is designed for ultimate mixing with Stems - the open, multi-channel audio format for creative DJing. A Stem file contains a track split into four musical elements - bass, drums, vocals, and melody, for example. Transition between elements stem-by-stem instead of using global volume and EQ control for an entire track. Or apply effects just to a specific stem. And to get really creative, swap elements across multiple decks - take the vocals from one track and mix it with the beat from another. CONNECT WITH YOUR CROWD Get physical with the music. Touch-sensitive knobs, faders, and LED-guided touch strips bring TRAKTOR software to life on vivid full-color displays, keeping you focused on performance - not on your laptop. The S8's touch-and-see workflow means you connect with your music - and with your crowd. HIGH-RESOLUTION DISPLAYS Two high-res color displays put TRAKTOR software in plain sight. Browsing, track info, effect, and filter values come into view directly in front of you. Keep an eye on the running track's ultra-crisp vector waveform. Or access Remix and Stem Decks in full view. YOUR STYLE. YOUR SOUND. For even more detailed track-editing on the fly, create your signature sound with responsive Remix Deck controls. Intuitively mix in sounds with the 4+4 channel performance faders . Plus, live capture and trigger your own samples and loops using the 16 color-coded performance pads. Your style. Your sound. This is enhanced DJ performance. BUILT FOR PERFORMANCE Connect anything your setup needs - TRAKTOR KONTROL S8 boasts the most expansive connectivity on a DJ controller yet. The on-board 4-channel mixer features unique wear-resistant faders that offer unprecedented durability. Plus, TRAKTOR Mode buttons on every mixer channel switch between TRAKTOR and stand-alone mode - ideal for handing the night over to the next DJ. DESIGNED FOR TRAKTOR PRO SOFTWARE TRAKTOR KONTROL S8 is built for seamless control of the included TRAKTOR SCRATCH PRO 2* - the DJ software trusted by countless professionals worldwide. Get in-depth control of your music with up to four software decks, Stems support, customizable interface, and advanced track library management. S8 "If you're serious about performing, you'll find that the Traktor Kontrol S8 does pretty much everything you could ever need." 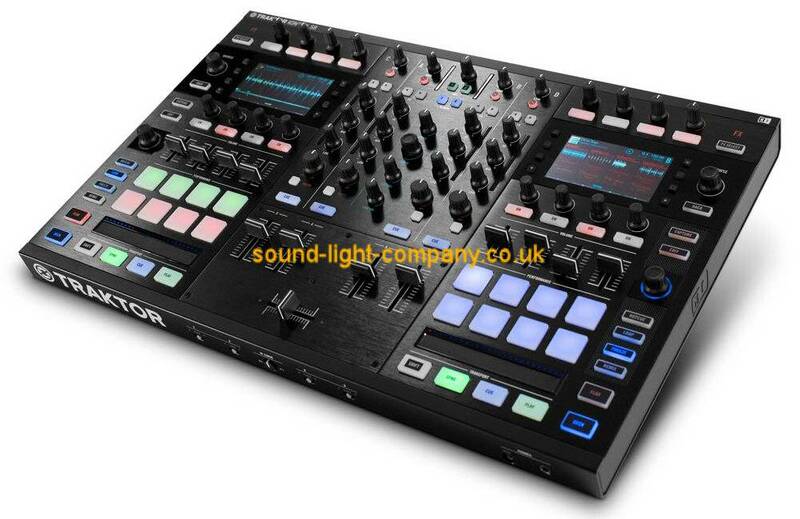 AskAudio Mag "The Traktor Kontrol S8 just begs to be played, dare we say it, like an instrument. This is a piece of hardware that will both inspire and delight." DJ Mag "Mixing with the S8 will feel like liberation. The built-in screens and remix decks offer a whole new creative palette to work with." Dancing Astronaut WIDE WORLD OF TRAKTOR Explore the wide range of cutting-edge, professional DJ hardware and software that is TRAKTOR.